Appearance | Hazy orange-red with off-white foamy head. Smell | Graham crackers, nutmeg, cinnamon, and pumpkin pie. Taste | Like a pumpkin pie, sweet malts with nutmeg, brown sugar, cinnamon. Overall | Pumpkin Punch! That’s how one would describe this Imperial Pumpkin Ale. This sweet and spicy ale is packed with everything you can find in a pumpkin pie, plus a 10% ABV. It is extremely rich; enjoy this ale with family and friends. It’s a sipper, that’s for sure! The sweetness of the beer is slightly overwhelming, in fact, this brew can serve as an autumn dessert all on its own, no need to compliment it with apple or pumpkin pie. 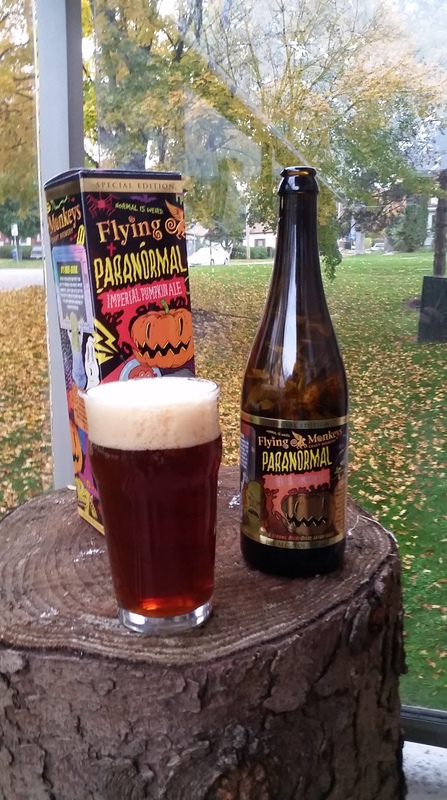 This beer rivals the infamous ‘Pumking’ by Southern Tier. It might be even better if Flying Monkeys could make this into a Imperial Stout?. Maybe I’m just reaching too far into the realm.